Author Hunter S. Jones has been busy since her poetical romance ‘September’ series ended. Always one to have a constant project brewing, Hunter’s books range from voodoo lust to online trust, and often feature a little bit of slap and tickle. Hunter’s latest is a new venture. A historical romance in Tudor England. Anne Boleyn in fact. The Tudors have always appealed to Hunter. It was part of her undergrad major in History with an emphasis on the English Renaissance and Reformation, so looking forward to the mix of fact and Hunter’s beautiful twists that will be weaved inside the fiction. “The Tudors have always appealed to me, it was the beginning of the modern era. Anne Boleyn was a woman who defied all standards and paid the ultimate price, simply because she had such grace & charm that a man, a king, fell in love with her & changed a country for the love of her“. 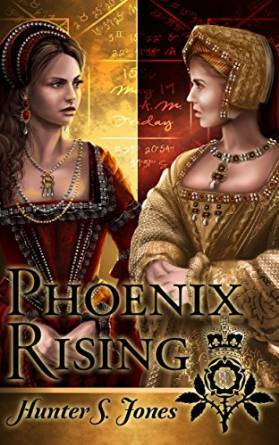 Phoenix Rising is set during the last hour of Anne Boleyn’s life as told from a descendent of the astrologer/physician of King Henry VIII. Using a ‘star map’ as a guide, stories reveal themselves, a novel tactic indeed. When a young Anne Boleyn arrives at the court of King Henry VIII. She is to be presented at the Shrovetide pageant, le Château Vert. The young and ambitious Anne has no idea that a chance encounter before the pageant will lead to her capturing the heart of the king. What begins as a distraction becomes his obsession and leads to her destruction. The dream of writers lounging around in cafes all day, filling journals with the spills of language is a seductive and cerebral fantasy of mine. Their inky black stained lips sipping dark stuff, is an extremely alluring vision. My passion lies with the poets, but in reality poets tend to make a living, well…not writing poetry. Liz Snow is a seductive creature with a tormented past. A business savvy with a lust for literature, discussion and analysis. She connects with lawyer Pete Hendrix, her eyes win him “fifty floors up in a tower of glass. The full catastrophe”. Their online liaison soon becomes addictive. They question their sanity, themselves and their new addiction. Fantasy,tragedy and poetry fill the pages of September Ends. This romance is wrapped in a very modern scenario. Neurons rule instead of pheromones and with that comes the vicissitudes of time, space and madness. So when you fall in love with a mind, do you fall in love with your own imaginings, or is that what we do, even if we fall in love with flesh and blood – no difference? Liz and Pete’s affection grows as they stare into the white light, each tapped line from a dusty keyboard sends them deeper and deeper in love. A mutual affection for words has them following and discussing English poet Jack O Savage. Jack is a poet with a punk heart. A sort of John Cooper Clarke with eyes dipped in Keats. He feels “as if this life of mine is not mine, that someone else is living through me, that I have no say in any of this, whatever this is” Well, Indie is dead, and ‘The Poet’ is pained with metaphor. Enter wings of a cyber butterfly and you will see lives unravel with all the hurt, beauty and pain of existence. The story moves like an internal play. It’s all in the mind or inside something else. A circuitry of lyrical wires crossing and sparking at breakneck speed. Chat rooms thump with sexual tension, words are a powerful aphrodisiac. Pictures flick by, an innocent peep show, thoughts are raw and a natural awkward dialogue begins to be revealed. Diary entries fatten thoughts, anxieties, doubts and storyline. When they inevitably meet, that’s when reality hits hard. The story now instead of being told in a vacuum now has a landscape, not just solitary figures looking for substance in their words, they have the sustenance of flesh, the hurt of lies… a bookend of tears. September Ends introduces it’s characters lives and motives well. It’s a sweet romantic drama, dripping with tears. September Again, the second book in the September series is not far away and I look forward to the continuing saga of sin, love and words.